Quigg Engineering Inc. is a DBE/WBE Transportation Engineering Consulting Firm that was founded in 2006 by Lori L. Quigg, PE and Rebecca L. Stocker. Recently, the company was selected as part of Build’s, American DBE Top 50. Taking time to profile the company was a spokesperson from Quigg Engineering Inc., who discussed more about the successful firm, as well revealing more about their innovative ways. Quigg Engineering Inc. is a DBE/WBE Transportation Engineering Consulting Firm that was founded in 2006 by Lori L. Quigg and Rebecca L. Stocker. It is headquartered in Springfield, Illinois with branch offices in Jacksonville, East Peoria, Joliet, Illinois; St. Louis, Missouri; Davenport, Iowa; and Lakeland, Florida. Quigg Engineering Inc. currently has 68 employees, including 22 licensed professionals. We have experience in Structural Design and NBIS Inspection, Construction Inspection of Highways, Railroads and Bridges, Surveying, Environmental Studies, Roadway/Freeway Design, Railroad and Airport Design, and Traffic Studies. Quigg Engineering Inc. hires professionals that have our same goals of taking pride in our work and wanting to satisfy our clients. Since opening our doors, we have worked with clients to provide professional, quality engineering and consulting services mixed with practical experience and common sense. Our experienced team of technicians, engineers, and surveyors emphasize technical details, accuracy, and an overall sense of professionalism in any task we undertake. We train our staff to follow specific QC/QA practices, however we do not micromanage; as this allows our employees to take ownership of their projects and have their abilities recognized, leading to more creative solutions. At Quigg Engineering Inc., our clients are very important to us. Understanding their goals and needs is the first step in providing the best outcome, which is all based on communication. From there, we determine the plan for achieving that success based on what the client wants. Some clients may want minimal involvement and to have the work completed with little interaction, whereas other clients, they want regular progress reports and the ability to review our progress at different intervals. Communication is the key to that success; understanding the client upfront and knowing what they need and how they need it allows us to have a successful project. In addition to providing professional services at reasonable rates, each employee takes pride in their work, but also in satisfying the client with exceptional service and quality. 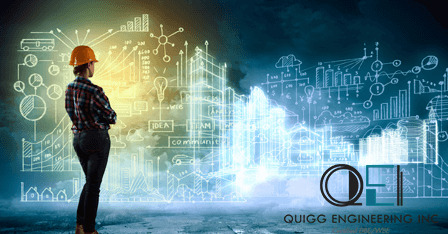 Here at Quigg Engineering Inc., we always want to be at the top of our game, and so we are continually striving to improve ourselves; that is not only in advancing in technology or in continuing education, but also in networking and marketing. We like to build lasting relationships so we work to maintain them. Also, we have a great deal of respect amongst our staff, which is seen by and appreciated by our clients. Being a part of the transportation industry is difficult, because infrastructure needs are ever increasing yet funding is ever decreasing. There are also fluctuations in staff which are difficult to manage; there is a gap between experienced engineers and young engineers, as well as a downturn in engineering students overall. We believe every company has to overcome challenges that make them stronger every day. Having the appropriate staff makes conquering the challenges easier; character is not measured by how people respond when things are going well, but instead by how they respond when things are not going well. Looking at the bigger picture, we have had our share of challenges, mostly related to growing pains, literally and figuratively, however we’ve found that people who take pride in their work, will always want to help solve problems and not create them. Finding staff that share those values of honesty, integrity, pride and respect is what strengthens our company overall as a whole. To date, our most successful project was a project that we received from a firm acquisition. It was a project that when we took it over, the client was ready to tell us to walk away from it since it was poorly designed. Not only did we have to convince the client that our Project Manager and our team will clean up the plans and do a better job, we also had the challenge of rebuilding that relationship. From this experience, we implemented new policies and procedures related to negotiating scope and services. We believe this was our most successful project because the whole experience involved so many people; it was a great learning experience for everyone. As managers, we want every job to be well done and profitable, that’s our goal and our job. The technical aspects of completing this project was never an issue for our staff, but the magnitude of building that trust with the client was felt by everyone in the company. Having everyone’s eyes open to the importance of doing a job well, communicating, and building and maintaining relationships – the lessons learned are what made it successful! Speaking of success, to be a part of the American DBE Top 50 is really an honor as it’s great to be recognized for the successful growth of our company. Quigg Engineering Inc. takes pride in doing honest work for honest pay, so to get recognized means that we’ve done a good job of providing for our clients. Being professional and maintaining quality and integrity is extremely important to every member of our team, so to be part of the American DBE Top 50 reinforces our persistence to maintain that excellence. We are continually striving to expand our services and grow our staff, so hopefully this recognition will help us advertise and legitimize us as a well-developed, full service transportation engineering firm. Our industry is also relationship driven, so by being recognized this way, hopefully it will convince a new client to give us an opportunity as we try to expand our services and build new relationships. keep them at the leading edge of what our industry demands. Whether it’s surveying using LiDAR or doing 3D modelling, investing in the proper training and technology that allows staff to do their jobs well has been Quigg Engineering’s policy. Moving forward, we are always focusing on what the future may hold for us. Infrastructure needs are ever increasing, especially with our bridges. Projects will depend on state and federal funding sources, which vary, so we hope that our strong relationships and good work continue to aid us in pursuing new projects. We are strong in structures, freeway/roadway design, environmental studies, surveying and inspection; being that diverse as a DBE has helped us in securing work. Over the next 12 months, we hope to strengthen those areas through hiring qualified staff so that we can add more depth of experience to our company. Quigg Engineering Inc. will continue to grow and work on long term strategic marketing plans so that we are able to reach as many potential clients as possible. Eventually, we would like to grow and get to a point of successfully graduating the DBE program. It’s a great program that without it, we would not have been as successful. We believe graduating from it one day lines up with the spirit of the program and should be every DBE’s goal. Overall, we are proud of every project that we have been a part of, large or small. As a Joint Venture Partner on the I-294 Mile Long Bridge Project for the Illinois Tollway, a $400 million endeavour, Quigg Engineering Inc. was responsible for overall management and coordination for the survey, environmental studies, bridge inspection, and aided in structure and freeway design. Quigg Engineering Inc. was also a part of the Chicago to St. Louis High Speed Rail project, where we were responsible for survey, environmental studies, construction inspection, and complex crossing design. Address: 2351 S. Dirksen Parkway, Springfield, IL 62703. Theresa May: 25,000 New council homes. But what does it mean?